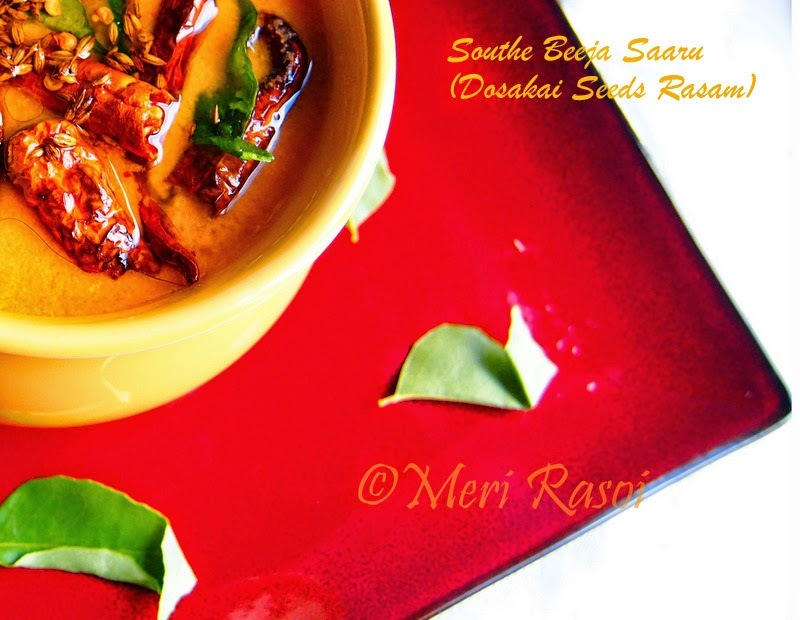 Today, I will be sharing with you all a delicious and flavorful rasam. This rasam made from the core (seeds along with the thin flesh surrounding the seeds) of DOSAKAI is mildy spiced and very light on the stomach too. This is yet another of my mum's recipe. She is an amazing cook and the best part about her cooking is that it is delicious and healthy too. Southe ( in Kannada) ... more commonly called as "Madras kakdi" or "DOSAKAI" is a great vegetable. I am referring to it as great because every part of the vegetable can be used in some or the other dish. As seen in the picture, at the center of the vegetable are the seeds (along with soft flesh) surrounded by the vegetable and on the outer side is the skin. After removing the skin and the seeds, the vegetable can be used in sambars, pachadis etc. 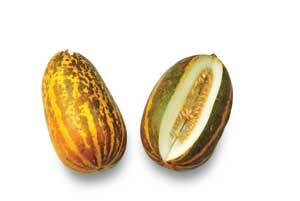 The amazing thing of this vegetable is that you can also use the skin and seeds for making other dishes. 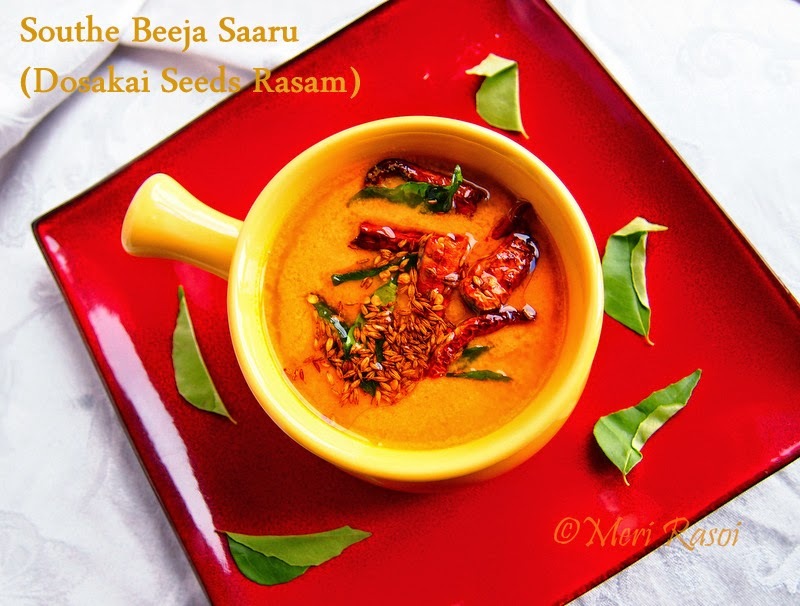 I use the seeds to make rasam . I use the skin of the vegetable to make chutney. 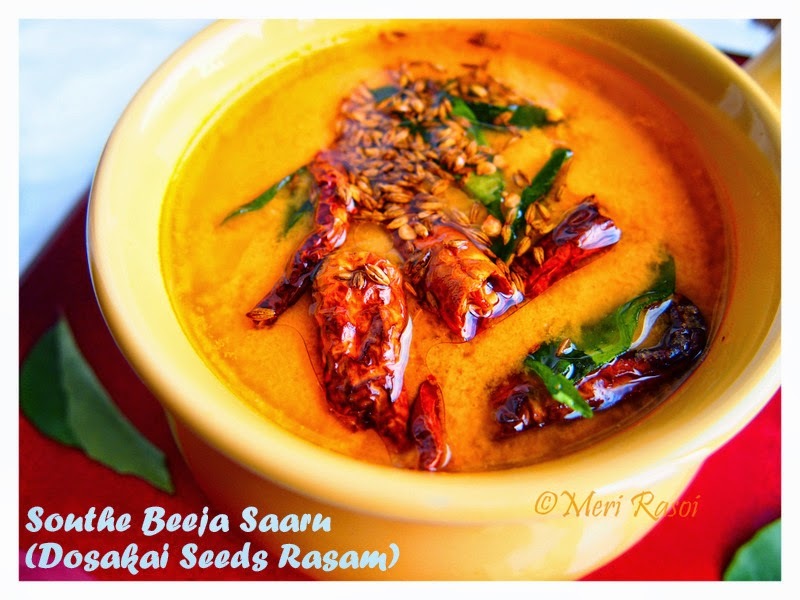 In today's post, I will mention the recipe for the rasam made from the seeds. So lets see how we can make it.. Taste the transparent flesh surrounding the seeds to see if there is any bitterness present. If it is bitter, do not make the rasam with it else proceed to the next step. Grind items 1-6 adding 1/2 cup of water. Strain the contents through a fine mesh to remove any coarse bits of the seeds. Add hing, salt and whisk well. Add enough water (approximately 2.5 cups) to adjust the consistency. Now bring this mixture to a boil. Simmer for 5 minutes and turn off the heat. For the tadka / tempering, heat 1 tsp of ghee. 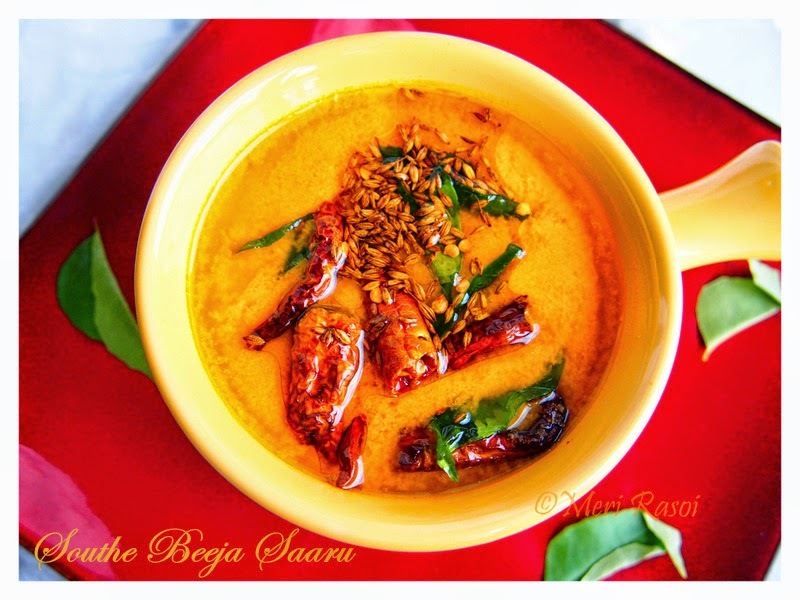 When the ghee is hot, add 1/2 tsp cumin seeds, 2 dried red chillies and curry leaves. 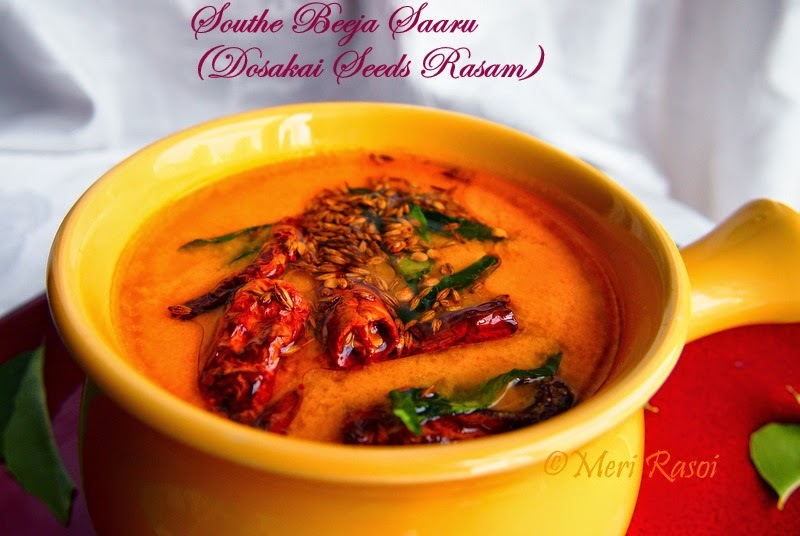 When the cumin seeds starts to splutter ,turn off the heat and put it to the rasam. Serve hot with steaming hot rice. NOTE: You can prepare this rasam with the core (seeds with the thin flesh surrounding the seeds) of CANTALOUPE / Musk Mellon too. this one is very new to me. This will be tried in my kitchen soon. Thanks for this Shubha. and that flesh would not make rasam bitter?? Well explained.. Yummy looking rasam .innovative..
A new & interesting recipe...............love to try. Cantaloupe & Madras Kakdi seed rasam prep is the same! Good.